On Valentine's Day I helped make friendship pizza with Kenya's class. The idea of making friendship pizzas are similar to making Quilt Pizza. Kenya's teachers loved the idea of expressing the spirt of the holiday to the kids by having them work together to make their lunch -- allowing each child to individually express himself but as part of a group. The kids were so excited and it was hilarious to watch how intensely they got into the activity. They worked together as a team, hitting, beating, tearing, whacking and (occasionally) mangling the pizza dough. They topped it with plenty of sauce and cheese before each child finally got to personalize his or her section with the toppings of their choice. Among the various toppings I brought was pineapple chunks. The kids looked confused as to why there was a bowl of fruit sitting alongside the sliced the mushrooms, peppers, olives and other toppings they were more used to seeing on pizza. I explained that when you put ham and pineapple on a pizza it's called Hawaiian Pizza. That made them roar with laughter. I'm not exactly sure why they found that so funny, but their laughter was so infectious I couldn't help but join in with them. 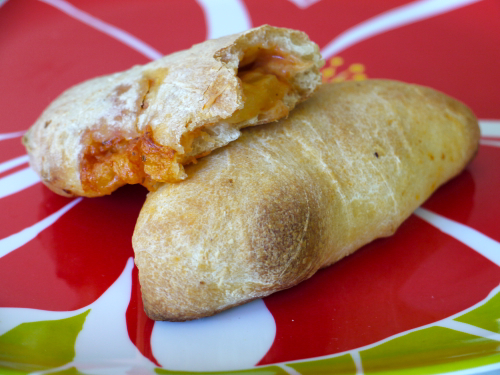 When I returned to work that day, I was inspired to make these Hawaiian Pizza Pockets which, in addition to it's apparently highly amusing name, is really fun to make with kids….and even better to eat! 2. Divide dough into 8 even pieces. Roll out each piece into a rectangle (approx. 6 x 6 inches). 3. Combine the sauce, cheese, ham and pineapple into a bowl and divide into 8 portions for each pizza pocket. 4. Place one portion of cheese mixture on one half of a rectangle. Repeat with the other 7 pieces of dough. 6. Place pockets on a baking sheet, lightly brush the tops with olive oil and bake for 18 minutes. * To freeze after this step, place pockets on a sheet pan and in the freezer for 1 hour. Remove and place in Ziploc bags, label and freeze for up to 3 months. When ready to eat, follow steps 6-7 adding an extra 3 minutes to the baking time. Will have to try this out. Yum! If you made it as 4 pizza pockets instead of 8, would the cooking time change? Thanks - can't wait to try! I was gonna make your spinach calzone tonight, but this sounds like a great option. My boy is not a big fan of fruit, but he may like it this way since he loves anything in dough. I think I'll make both tonight! Thanks for the recipe. This would be the full recipe of the Whole Wee-eat Pizza Dough! That will make 8 Pizza Pockets! YUM! What a great alternative to the traditional pepperoni/cheese pizza. We'll be making this within the week, looking forward to it. Pinned it on Pinterest too, so that way I won't forget about it! This sounds great! What kind of ham would you use? You can use any kind of thick ham that you can cut into chunks. I like going to my butcher and seeing what he recommends or has on hand. I happened to have two packets of Trader Joe's whole wheat pizza dough in my fridge last night when I saw this recipe. I made mine a veggie version with finely diced mushrooms, spinach and cheese. My husband and 4 year old loved them. I also followed your directions for freezing them. We ate 8 and froze 8. Perfect for a quick and healthy dinner for my daughter on the fly! Thanks for the fun idea.